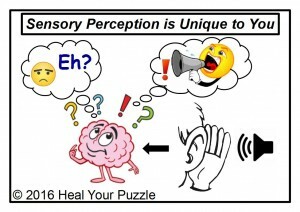 Heal Your Puzzle » Blog Archive » Sensory Perception… Do you like how you See the World? Sensory Perception… Do you like how you See the World? Last month I wrote about ‘Does your Life have a Pulse?’ and I mentioned Sensory Perception and how sometimes your Life can make you feel truly alive and in the moment. Are your senses operating in a different way at these times? Is what you are sensing real or illusory? Since then I also came across some information on Sensory Perception Disorder, which is being researched as a possible alternative way of thinking about other disorders such as ADHD and Autism. With SPD, sensory signals are not organised into appropriate responses much like a neurological “traffic jam” and it can make every day tasks challenging causing eg. clumsiness, behavioural problems, anxiety or depression and so the effects of our sensory perception can be very life-enhancing or very debilitating. How we sense our environment is the first step in how we begin to relate to everything around us; all relationships start at this sensory level… our relationships with people, events, objects, feelings, ourselves within… everything. My work with Energies points to our ability to form healthy empowering relationships as being fundamental to our well-being and good health. ‘Sensory Perception’ is the neurophysiological ability to process the stimuli in your environment via “the senses”, the primary ones being hearing, vision, taste, smell, touch and many others such as for temperature, proprioception, pain, balance, and vibration. Signals are sent via the nervous system to the Brain. Each person’s Brain will interpret the information based on its own personal database of experience and abilities; we are therefore all unique in the detail of our perceptions of the World around us. Seems obvious doesn’t it? Your Perception of Everything designs your Life. This includes not just your Conscious Perception but also your deeper Sub-Conscious Perception and these will be the building blocks for your whole environment and your place within it.